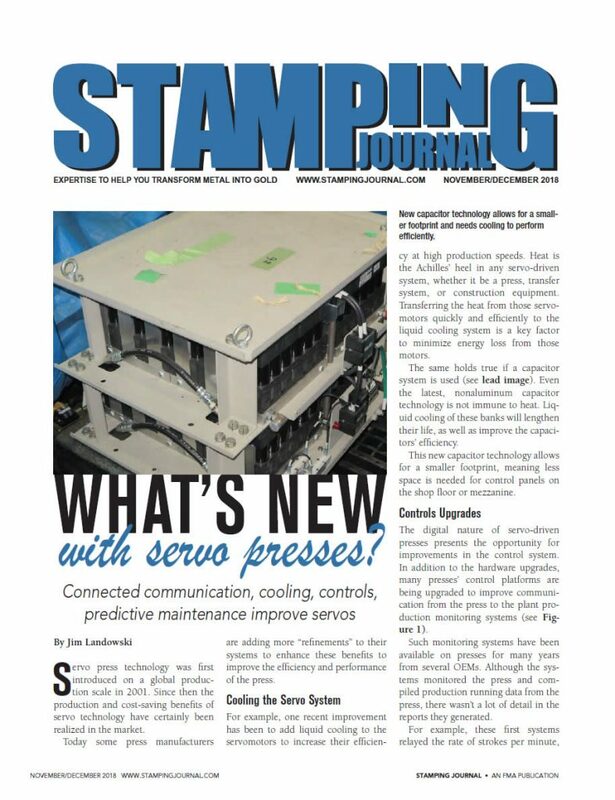 Our own Jim Landowski wrote an article for the November/December issue of Stamping Journal spotlighting improvements with our systems. George Washington once said, “Decision making, like coffee, needs a cooling process.” The words strike a chord with Tom Simeone, second-generation owner and president of Manor Tool & Manufacturing Co. An engineering graduate of the University of Illinois at Champaign-Urbana, he recalls that one of his professors gave him a “cooling off” period to make a life-changing decision. Today, Manor houses punching, bending, forming, spot welding, deep draw stamping and assembly operations in its 44,500-sq.-ft., Schiller Park, Illinois, facility. Manor produces prototypes for short-run stampings and fabricates parts in high production volumes. Manor also builds tooling for parts and runs customers’ dies in its 32-press production operation. First-of-its-kind press line soon to be followed by a few more. New Komatsu Servo Line in action at FCA’s Warren Stamping. 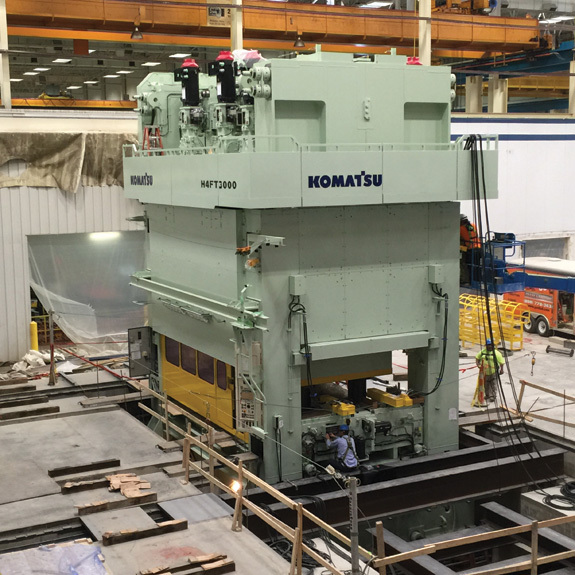 Warren Stamping’s new 180-inch press line from Komatsu (komatsupress.com), which started up in late January, is replete with technical advantages. All dies, automation, sheet stacks and control settings are computer-controlled and designed to change jobs automatically. 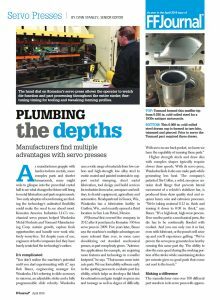 “With timing, coordinated effort and preparation by the press operation crew, the line automatically prepares all systems for making the next group of parts,” says Doug Klumb, sales manager at Komatsu America’s large press division. Die change occurs in a sequence of simultaneous motions taking place in under four minutes compared to more than 20 for Warren Stamping’s existing lines. The “servo” in servo tandem press line refers to servo motors and drives that provide 100% programmable control and movement of each press ram at any position in the press stroke, compared to a mechanical press operating at a fixed speed. 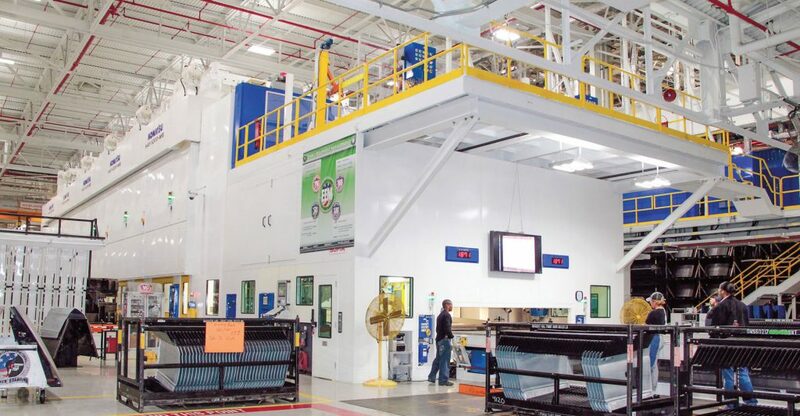 The new press line is the first of its kind at Warren Stamping and the entire FCA North American stamping operations, although three more will be in operation at FCA’s Sterling Stamping Plant in Sterling Heights, MI, later this year. For Warren, the new press line increases capacity by up to 12,000 hits per day, or approximately 3.6-million parts per year. The Warren plant, which also has 12 other major press lies and three large progressive press lines, has a total plant capacity of some 84-million parts per year. Initial results of the new press line should certainly help. It can run steel body panels at up to 18 strokes per minute (spm) and 15 spm for aluminum, in some cases twice the speed of existing plant lines, says Komatsu’s Klumb. Regarding energy use, the servo motors and drives act as generators when slowing, actually generating electricity during a portion of each press cycle and reducing total plant consumption. 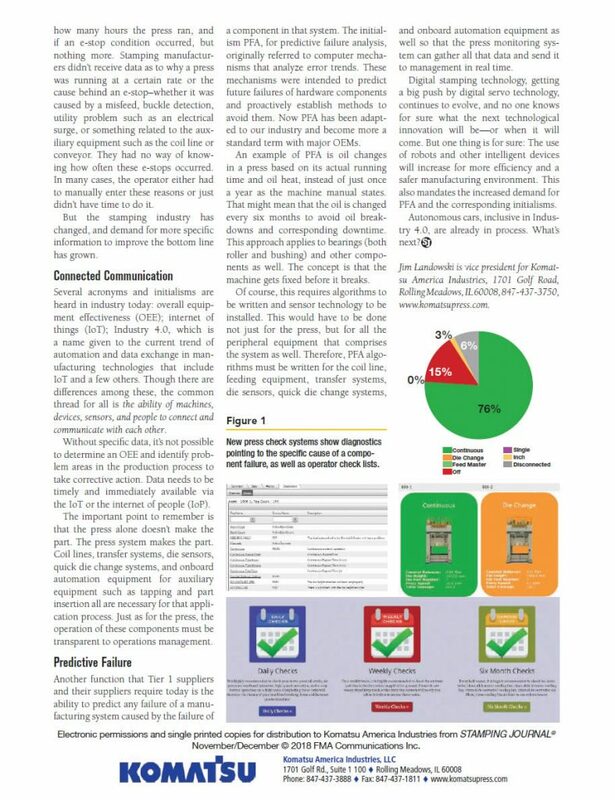 More efficient die change and modular press line design ease maintenance and repair, and quiet operation improves workplace safety. Indeed, standing next to Warren Stamping’s Line 25 in operation, the sound of the adjacent Line 23 strikes the dominant note. “We can run 10 jobs in the same press line, and the improved ability to go from job to job, all with fewer touchpoints, is critical,” Goimarac says. He credits the press-to-press transfer as well-conceived, greatly reducing the number of times a blank is picked up and dropped.